How is the wood furniture looking in your main lobby? Have the arm rests and the legs begun to lose their luster? Are scratches in the surface beginning to become more noticeable? Make your wood furniture look new again by giving it a quick polish. Polishing your wood furniture isn’t as hard as it sounds. Here are some simple steps to follow to make your furniture shine. Why is polishing wood furniture important? Polishing is important, not only to enhance the appearance of your furniture, but also to help protect it. Regularly polishing your wood furniture does five things; it cleans the wood, it helps to conceal minor scratches, it makes dull furniture shine again, it offers a degree of protection from future scratches, and it can add a fresh scent to the room. Some choose to use an all purpose cleaner when it comes to cleaning wood. Not only can this make the wood become more dull, but in some cases it can damage the wood as well. For this reason, all purpose cleaners are generally not recommended when it comes to cleaning wood furniture. The one exception to this is when the wood has a plastic coating, as found on most kitchen tables. Regular soap and water also should be avoided. Water left on the surface can leave spots on the wood that can be very difficult, if not impossible, to remove. What kind of wood polish should I use? 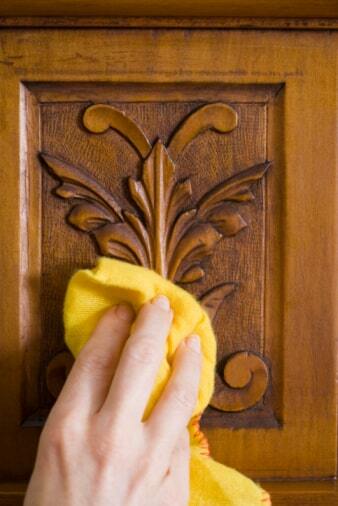 There are two types of wood polish that work great in restoring the look of your wooden furniture. One is Cream Furniture Polish. This product is a ready to use silicone based polish. It works great in polishing dressers, chests and bed posts as well as other wooden office furniture. Another highly recommended wood polish is Lemon Oil Furniture Polish. This product is also a ready to use wood polish. Unlike the Cream Furniture Polish, this polish is silicone free. It works effectively in polishing desks, bookcases, hand railings and other wood furniture as well. Both of these polishes work effectively in cleaning and protecting your wood furniture. It is important however, to note the difference between the two. The biggest difference is, as mentioned before, one is silicone based while the other is silicone free. Why is this important? Silicone based wood polish makes the surface more slippery. What this means for you is the wood will look shinier, restoring the natural beauty of the wood, and it also offers a layer of protection. Silicone based wood polishes often tend last a little longer as well. However, silicone based products can be difficult to remove from the wood. Since it is so hard to remove, it can make refinishing a wood surface very challenging. How do I apply the wood polish to the furniture? Apply to surface. Both polishes mentioned above can be applied in the same manner. Simply pour some of the polish on the wood and begin to rub it into the woods surface with a micro fiber cloth. Always polish the wood with the grain rather than against it, or in a circular motion. A circular motion can leave minor scratches in the wood that can become noticeable overtime. It is also important to use personal protective equipment, such as gloves, when applying polish to the wooden surface. Choosing a cloth. You do not need a special cloth for polishing wood. A cleaning cloth or a micro fiber cloth work great in polishing. However, avoid using a coarse cloth or one that attracts a lot of lint as this can leave scratches in the wood. Minor scratches. As you are polishing the wood, keep your eyes open for minor scratches. Some scratches can be buffed out with the wood polish and a micro fiber cloth. Deeper scratches in the surface of the wood may need to be sanded and refinished. Detailed wood work. Detailed wood work can make it very difficult to polish. An easy way to get in those hard to reach corners is to first rub in the polish as much as you can with the micro fiber cloth. After you have polished as much of the wood as possible, take a very soft bristled brush and work in the polish in the difficult areas. Tips for preserving your wood finish. Avoid sunlight. Direct sunlight over time can begin to fade or discolor the woods surface. In order to preserve the finish for a long time, try to keep the furniture out of direct sunlight if possible. Protect against damage. Wood polish does offer some minor protection. Unprotected wood exposed directly to such things as heat and water can destroy the wood finish. Preserve the wood finish by making coasters, tablecloths, and mats available. Add “polish furniture” to your regular cleaning schedule and keep your furniture looking great. This entry was posted in Furniture, General Cleaning, Janitorial and tagged cream furniture polish, lemon oil polish, polishing wood, wood polish. Bookmark the permalink.